A New York Times Notable Book of 2018. Winner of the 2019 Lionel Gelber PrizeMajestic, informative and often delightful ... insights on every page Yanis Varoufakis, ObserverThe definitive history of the Great Financial Crisis, from the acclaimed author of The Deluge and The Wages of Destruction. In September 2008 the Great Financial Crisis, triggered by the collapse of Lehman brothers, shook the world. A decade later its spectre still haunts us. 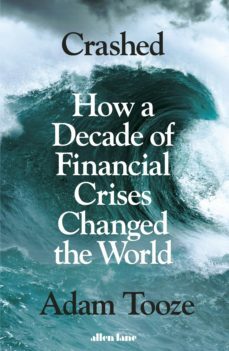 As the appalling scope and scale of the crash was revealed, the financial institutions that had symbolised the Wests triumph since the end of the Cold War, seemed - through greed, malice and incompetence - to be about to bring the entire system to its knees.Crashed is a brilliantly original and assured analysis of what happened and how we were rescued from something even worse - but at a price which continues to undermine democracy across Europe and the United States. Gnawing away at our institutions are the many billions of dollars which were conjured up to prevent complete collapse. Over and over again, the end of the crisis has been announced, but it continues to hound us - whether in Greece or Ukraine, whether through Brexit or Trump. Adam Tooze follows the trail like no previous writer and has written a book compelling as history, as economic analysis and as political horror story.